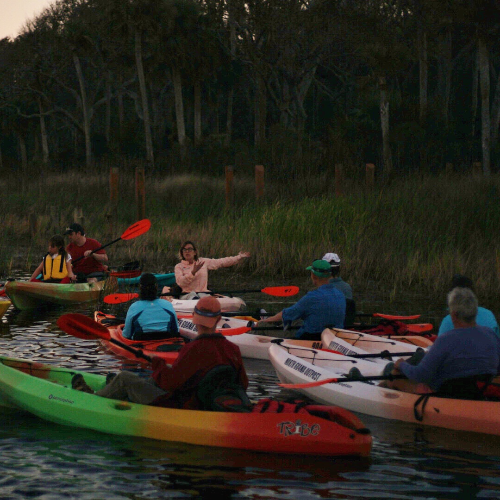 Join us for a winter paddle along the Guana River at one of our preserves in Ponte Vedra Beach, ending just around sunset. No prior paddling experience is necessary! We will be launching from North Guana Outpost at 4415 Mickler Road, Ponte Vedra Beach. Please plan to arrive about 15 minutes early for check-in and a safety briefing. We recommend wearing long sleeves, bug spray, and clothes/shoes that you don't mind getting wet. Our group size is limited, so please register if you plan on attending - even if you are bringing your own kayak/canoe. No refunds for cancellations. Join us for this scenic paddle on the Guana River!